Aaaaiiiieeeee! This is the greatest BP piece that I've come across. Just listened to it 6 times in a row. Now I REALLY need a BP guitar. What I'm very intrigued by is how you made the "bad" BP intervals work (the ones that sound like out of tune 5ths and "octaves") in the harmony, but managed to keep a distinctly BP flavor in the melody, which is as beautiful and well-conceived melody as any from any scale or music ever. One thing I've noticed is that a lot of simple, unabrasive chord progressions in BP can be done just by transposing the chord shape up and down by a minor third (that is two frets on a BP guitar), which is basically what the backing chords are in this recording. One note, the highest note, is a droning open string and doesn't transpose with the rest of the chord. I'm also pretty sure nylon strings help reduce the cringe factor for chords, compared to steel strings, though I haven't tried to make a steel stringed BP guitar to test that. For the bass, I'm actually not sure whether I'm cheating or not. 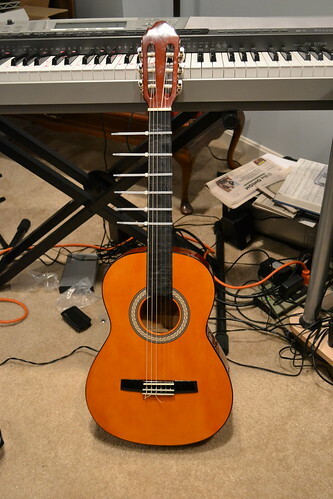 I started out with low notes on the guitar itself -- the first being the same as a concert open E (which is what my lowest string is tuned to), then up one fret, up two frets, and back down. But then instead of using the BP guitar, I used bass samples that were an octave down from what they would've been on the guitar. I'm never sure, in BP, whether it is "cheating" to use octaves when mixing multiple instruments. If I had treated the bass samples as being on the same scale as the guitar, they probably should have come out slightly sharper. The melody takes advantage of the "weird" parts of the BP scale far more than the chords. I'm not sure how to describe why it came together the way it did, other than that I kept the parts that I liked and threw out the rest :) The chords themselves and the bass line surely balance it out and help the brain make sense of the melody. Thanks, Sean. I am still hoping to develop this into something with lyrics -- I'm still coming off a long bout of writer's block! I've also thought about splicing together a saxophone solo in an alternate version, if I can find a suitably mellow sound. but other fret would be BP. No need to move frets.